When Ralph craves something to eat, it means he MUST HAVE IT! Last week, he was craving for Ayam Penyet (Smashed Chicken) desperately, like a pregnant woman! So, we headed to Kota Damansara. Unfortunately, the restaurant is closed. He suggested we try another restaurant in Dataran Sunway Mentari. I was afraid that he couldn't survive a day without it. So I agreed. We were ridiculously happy (people would have thought we just won our first million) to see Ayam Penyet-AP Restaurant was still open when we reached there. Okay here comes the traditional Indonesian food! 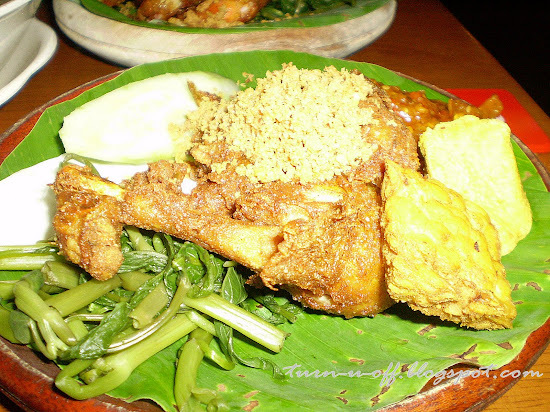 A quarter crispy chicken, a piece each of fried bean curd and tempe, some boiled kangkong, fresh cabbage, BLAZING HOT sambal belachan and bits of crunchy golden brown fried fritter topping on the chicken. 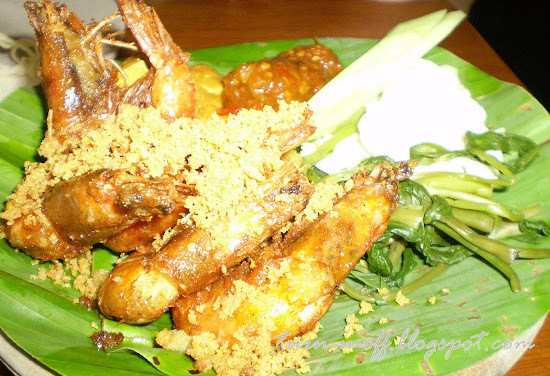 Udang Penyet (Smashed Prawn). All mine! Ohhhhh my... so delicious but my lips were on fire after that meal!!! Good, his craving has been satisfied. Yet I'm CRAVING that right now. Ayam Penyet!!!! I want!!! :) :) The one at Sunway Mentari yang nice kan??? oooohhh i love the samballllll!!! Recent blog:=- Happy Happy Raya!! i love loads of crispy thingies on mine!!! You're right about the blazing hot sambal, mon!!! That's what makes ayam penyet SEDAAAP!! hmmm 9! :-D :-D :-D for me lah lol!! yeah there are a lot kan?? that's why when marzie asked me last time also i can't tell her exactly where.. because syura yang always buy. I only know that it's at mentari!! LOL! Wah 9 out of 10, sure must try…what’s the name of the shop Mon? Ohhhhh now I see it…. So sikit sambal, Im going to ask for extra LOL!!! OMG Mon.. now I am craving for some.. though I never tried it!! Wah Lj never tried penyet??? Must try! for u maybe 2 out of 10 lor lol! ok the name, Ayam Penyet-AP Restaurant. I prefer the prawns hehe! I had prawn penyet on Monday he he…. eh not so sikit lah the sambal...maybe becoz of the chicken too big dat's why u can't see sambal LOL! Dropped 79 cards so far lol.. I love ayam penyet! Esp the chilli..
Never tried anything other than chicken though..
Maybe I should since I dont really eat the chicken..
i wonder what will be your next food post! always yummy stuffs from you! AP memang best pernah gak try di Bangi hari tu.. Recent blog:=- halloween: code geass (コードギアス)..
...he was craving for Ayam Penyet (Smashed Chicken) desperately, like a pregnant woman!... LOL! Recent blog:=- Desperately Seeking A Kitchen Makeover! Ayam penyet? Actually I have not eaten that before! Is it nice? Is this restaurant located near the Bangkok Wasabi? Hi, that makes me hungry now, it looks so nice! Lol at ----- desperately like a pregnant woman. Haha. Owh, now i thinking of having ayam penyet. I only had three roti penyek this morning. Hehe.